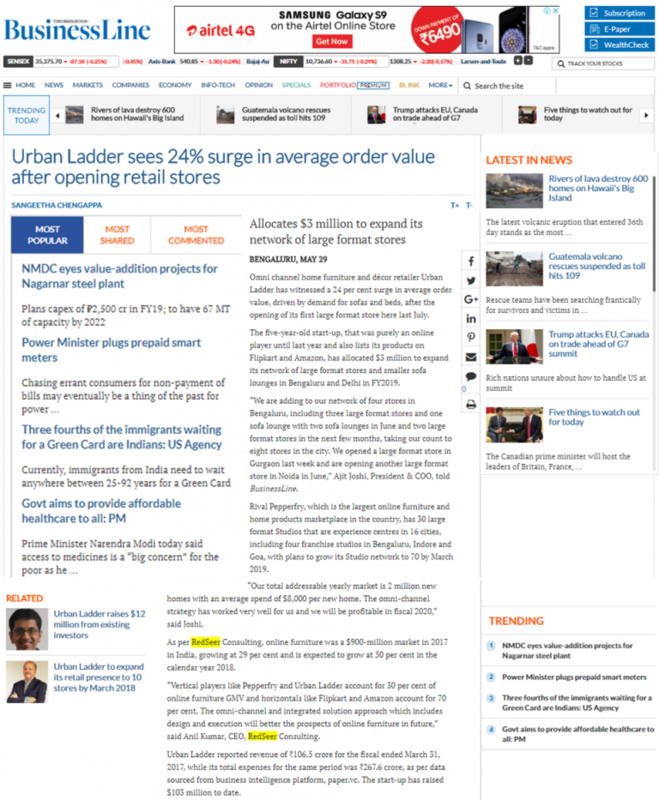 THE HINDU BUSINESSLINE: Omni channel home furniture and décor retailer Urban Ladder has witnessed a 24 per cent surge in average order value, driven by demand for sofas and beds, after the opening of its first large format store here last July. The five-year-old start-up, that was purely an online player until last year and also lists its products on Flipkart and Amazon, has allocated $3 million to expand its network of large format stores and smaller sofa lounges in Bengaluru and Delhi in FY2019. As per RedSeer Consulting, online furniture was a $900-million market in 2017 in India, growing at 29 per cent and is expected to grow at 50 per cent in the calendar year 2018. “Vertical players like Pepperfry and Urban Ladder account for 30 per cent of online furniture GMV and horizontals like Flipkart and Amazon account for 70 per cent. The omni-channel and integrated solution approach which includes design and execution will better the prospects of online furniture in future,” said Anil Kumar, CEO, RedSeer Consulting. Urban Ladder reported revenue of ₹106.5 crore for the fiscal ended March 31, 2017, while its total expenses for the same period was ₹267.6 crore, as per data sourced from business intelligence platform, paper.vc. The start-up has raised $103 million to date.